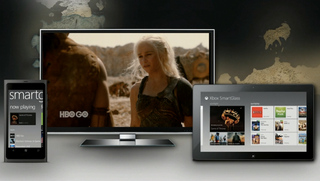 Before E3, Microsoft registered every possible permutation of "XboxSmartGlass" and "MicrosoftSmartGlass," tipping off Monday's reveal of the technology that will connect the Xbox 360 to Android and iOS devices. Well, they got every possible combination except one: "XboxSmartGlass.com." That's owned by one Tang Haiyue of Guanghzhou, China, who bagged the domain on June 1, right around the time Engadget broke news Microsoft would debut SmartGlass in L.A., and the other domains were discovered by registration watcher Fusible. XboxSmartGlass.com at present contains some generic posts as it is "a nonprofit blog to introduce the smart glass industry knowledge." And that's nice, really. But as Microsoft filed trademarks on "SmartGlass" back in January, there's a solid chance the National Arbitration Forum will pry this domain loose and hand it over to Microsoft.